My Unexpected Forever is a beautiful journey through emotions to find healing and love. It's about learning to move on when you're life goes in a direction you never imagined coming. It's the 2nd book of The Beaumont Series and while I guess you don't have to read the 1st, Forever My Girl, you may have a harder time picking up on pieces of the story if you haven't. From the first moment Harrison met Katelyn he knew she was special and needed her in his life. The only problem is she's still grieving the unexpected death of her high school sweetheart husband and father of her twin daughters. Knowing he needs her in his life, even if it's only as friends, Harrison find ways to interact with Katelyn, whether it's mowing her grass or helping her with the details of her new job as the band's manager. He wants nothing more than to be her support, to be the one she trusts, to be the one she confides in and opens herself up to. He doesn't want to take the place of her husband he just longs for her to find a place in her heart for him. Katelyn finds herself drawn to Harrison and his son Quinn but fights the feelings. After all, Harrison cannot possibly be her type, he is the polar opposite of her husband, covered in tattoos, someone her mother would never approve of and what would people in Beaumont say. She loves her husband, he is the love of her life even if he isn't alive and she plans to live the rest of her life faithful to him. So as you can see there is no way she can be attracted to Harrison or even consider any kind of future with him, other than possibly friendship. Why is it though she finds herself wanting to see him, wanting to ask questions, not wanting him to give attention to other women? This is a beautiful story in which two characters find love when they least expect it and their lives taking a path they never envisioned. It wasn't instant and it certainly wasn't easy. I loved Katelyn's character. Her inner dialogue, thought process and eventual actions were 100% genuine and completely relate able. I cannot even imagine having to pick up the pieces of my life like she did with her own, talk about strength. And let's not forget what a compassionate, patient, understanding man Harrison ends up being. My heart went out to him on more than one occasion when his feelings or heart wound up being trampled. He was persistent with a heart of gold and some seriously pure intentions. I honestly couldn't help but fall for this seemingly "bad-boy" who deep down was a genuinely good man. I also love Katelyn and Harrison's story wasn't rushed and it wasn't solely focused on the two of them. The whole book kind of had a familial feel, which I think only added to the depth of the story. Of course by the end its all wrapped up with a nice red yet completely realistic bow. Fans of The Beaumont Series will be pleased to know they get to see plenty more from Liam and Josie including their wedding! 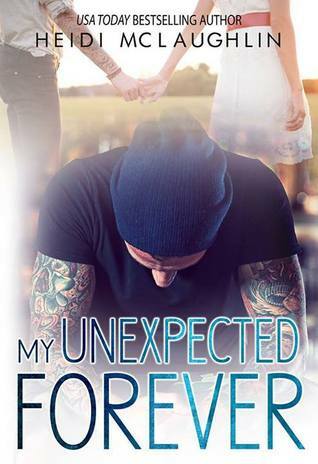 My Unexpected Forever was a great addition to The Beaumont Series and a truly enjoyable book. Don't hesitate to jump into this story.